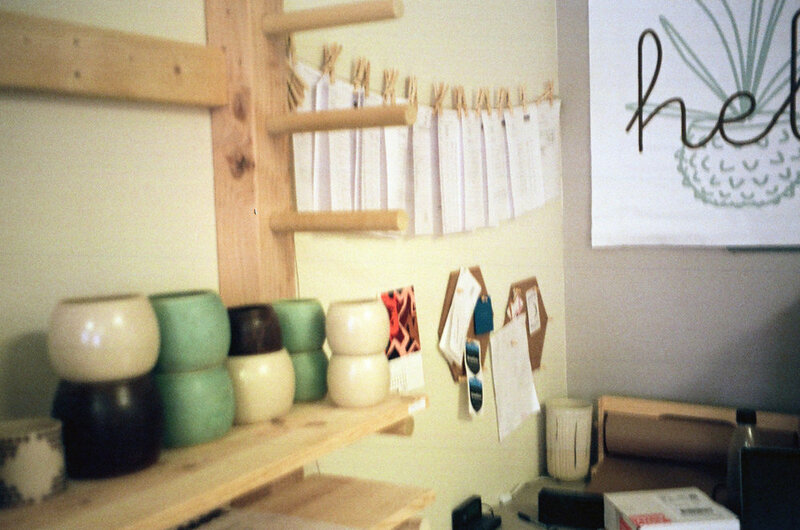 Carrie Hause is the owner and artisan behind Held Ceramics. 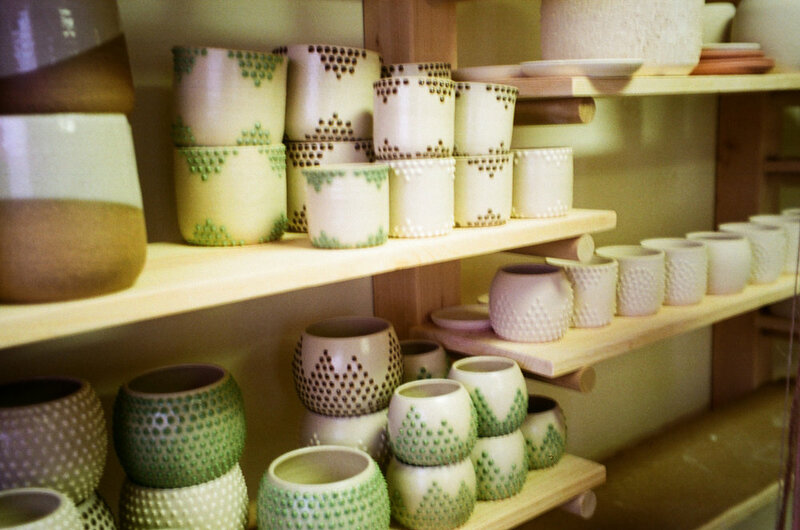 Held is a collection of handmade pottery for you and your plants. Through surface design and shape, Held creates a tactile and visual experience. Between my other business, A Wool Story and Rosemarine Textiles, I have been a creative small business owner for the last four years. It's definitely been a journey and a learning process! One of the most inspiring parts of running your own creative business is connecting with other people who are working towards similar goals of expressing themselves creatively through their work and making a living. I'm excited to continue to share the work of some of my friends and favorite local business owners - what their creative process is like, the day-to-day of running their businesses, and what they're working towards. This week I'm chatting with Carrie Hause, the Hamtramck based ceramic artist behind Held. Carrie and I are great friends and it was so much fun going to her studio to take these photos and learn about how she navigates her creative business and life. 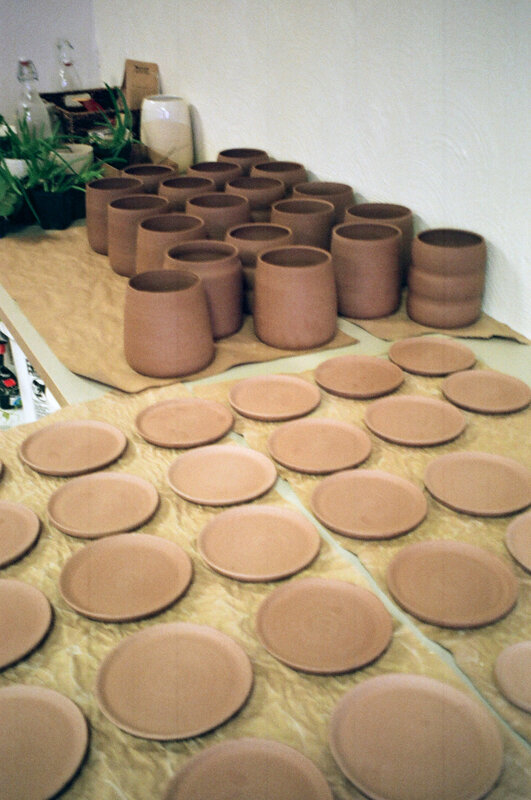 Held is a collection of handmade pottery for you and your plants. Through surface design and shape, I create a tactile and visual experience. Do you have a business partner or employees? Nope - I work solo as of now. But I’m considering taking on some help within the next year or so. I started selling ceramics in 2014 but officially started as Held in January of 2015. Do you do your business full time? Yes. I’ve been running Held full time for the last few years. Where is your business located in Detroit? My new studio is in Hamtramck. I was previously working from a pottery co-op Southwest Detroit, until this last December when I opened my own solo studio. I’m testing out retail hours on Wednesdays from 4-7pm for customers to shop the full collection, as well as seconds and samples for discounted prices. How long have you lived in Detroit? I’m coming up on 8 years in Detroit. Previously, I lived in Grand Rapids for school and work. I moved to Detroit to get involved in the urban agriculture scene. I started working for The Greening of Detroit for 3 years and dabbled in my own farming business with a partner. I was taking ceramics classes at the same time and doing it as a hobby. While I was working at the Greening, I wasn’t making a lot of money (it’s part of AmeriCorps and is a nonprofit) so I started selling the ceramics I was making on the side at Eastern Market on Sundays. I took my first ceramics classes at Pewabic - a historical pottery space in Detroit. My boyfriend delivers me coffee in bed at 6:45/7am. Then I’m usually out of bed by 8am. I’ve been trying to have really chill mornings lately which has been nice. I get up and read in bed for a while, then I do yoga at home, make myself breakfast and pack a lunch and then I come to the studio. I’ve been on a reading storm lately. I just finished Where the Crawdad Sings and before that I read Then She Was Gone. I use this app called Asana Rebel to do yoga. It’s a video on your phone to do 4/5/6 min video and 15/20/30 min videos. I usually do 2 or 3 depending on the length, it describes the moves to do and is also a video. Lately for breakfast I’ve been making overnight oats or smoked salmon on toast and an egg and pickled carrots and dairy free cream cheese from Trader Joe’s. I normally go into the studio from 10-4 or 5 except on Wednesdays when I have open studio hours and I come in a little later. When I get into the studio I try to do a mix of computer stuff and production everyday. Being at the wheel is hard on my back so I try to break up activities so I don’t do it for too many hours at a time. I generally have days where I’m throwing or days where im trimming or putting spikes on pieces, loading the kilns. Friday is my shipping and cleaning day. After work, I will either do some cooking or some random house chores or reading or social things. I generally am in bed by 8:30 and falling asleep between 10:30. What's your favorite part about the process? I like all the parts of it in moderation. I like throwing and experimenting with new shapes. Lately I’ve been trying to push myself to throw bigger stuff which is really challenging and fun for me. Throwing is when you have a lump of clay and shaping it into what it’s going to look like. I also like trimming because the pieces you’ve made are almost perfect and then you clean up the bottom and they look just right. I like doing the spikes too as long as I don’t have to do too many in a day. It’s nice to have a studio space and have all my work in one place and be able to just relax at home and work at my studio. Having the separation of work and my personal life has been a huge improvement since I moved into my new studio. What's your least favorite part about the process? The repetition! When I have to make 40 drip trays in addition to 40 pots 🤯. I don’t like having to make a ton of the same thing over and over because it feels like a burden and not super fun. I’m really not into marketing - I basically don’t do it. At one point I was trying to post daily on Instagram - that lasted about a month before I hated it. Now I post once a week and post mostly daily fun stuff on stories. I’m not a person who is addicted to my phone, it’s mostly a distraction for me. I keep my phone on silent because its messy in the studio and I have to wash my hands every time to check it which gets annoying. I want people to see what I’m up to and I think it’s a cool way to communicate with people, but I just don’t like it to be a big pressure. I want to do it when I want to do it - I don’t feel fulfilled in any way by scrolling through feeds. Shipping wholesale gives me the most stress because I have to make sure everything is really really padded and secure so it doesn’t break in shipping. It’s quite tricky with ceramics! In the summer I love to go to the beach and swim. If I have time to go to the west side of the state, I love swimming in Lake Michigan. I also like gardening, reading and cooking (and canning in moderation). I like to can enough to eat all winter but not so it makes me want to die in the summer (lol) and I haven’t quite found that sweet spot yet. Food in Jars is a great website for canning recipes. I mostly get my inspiration from nature. My sister lives in the desert and I visit her there once a year. It’s really beautiful there - I love all the colors, it’s a big source of inspiration for me. The brown clay that I’ve been using looks like desert dirt and that’s why I like it. Most of my work is made for holding plants so it makes sense for the pieces to be inspired by nature. I really love being a part of Detroit’s small business community. It has been cool to get to know other business owners. It’s so helpful to have people to talk through issues and bounce ideas off of, even though we work alone. I’m very grateful for that now. I love seeing vendors at shows - because so many of them are my friends! I think there’s a really good makers community in this area that are supportive and not competitive. What's the biggest lesson you've learned about running your own business? Running a business is really hard! Learning how to communicate with customers, especially difficult ones has been a process. I always try to take the emotion out of my responses because my work is so personal - trying to not take it personally if someone doesn’t like their order. To run a business you have to be really motivated. Treating it as if it’s a “real job” with normal hours is important. It’s nice to be able to set my own schedule but I have to have boundaries and stick to them for when I’m working and not working. I don’t like working for other people because I don’t need or want to be micromanaged. I enjoy the freedom of being able to just do my own thing. My goal is to grow Held a little bit bigger so I can be more comfortable financially and save money, but also keep it really small and manageable. I’m thinking of maybe hiring someone to help with production and admin work within the next year. Where are your favorite places to go in Detroit? What's next for you and your business? I’m really looking forward to getting a bigger car to fit more ceramics! Birmingham Art Fair Mother’s Day weekend (it’s my first time doing it), hopefully Ann Arbor Art Fair, maybe doing a show in Pittsburgh this year. In the meantime I’ll just keep cranking out wholesale orders. Thanks so much for taking the time to be interviewed Carrie! You can find her work on her website and on Instagram.